In this article we will discuss how to read the price trend (up or down) that is by knowing the ending of a movement trend forex.Who where when the existence of the sign or signal the trend will end, soon will be going the direction of the previous trend reversal (reversal). How to analyze or predict the trend will turn around the direction, we will use technical analysis with indicators of reflexive trend direction. By knowing when the moment the trend will turn around the direction, we can take advantage of to take new positions open. And by knowing movement trend will end, can be used as a mark to close (close) open positions that have been opened before. So as to minimize losses and maximize your profits. 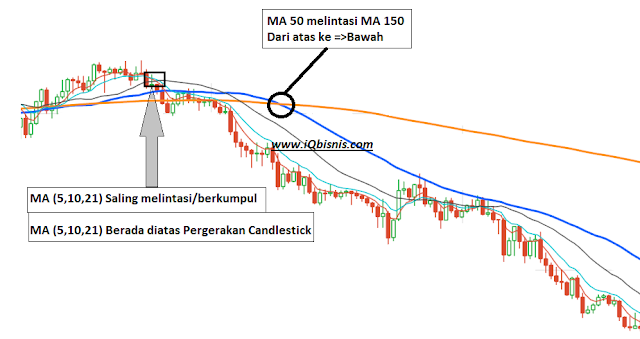 This forex trading strategy will use the indicator Moving Average line 5 in order to make the results more accurate. And very powerful tool to predict impending reversal of the direction of the trend and know the signals that the trend coming to an end. 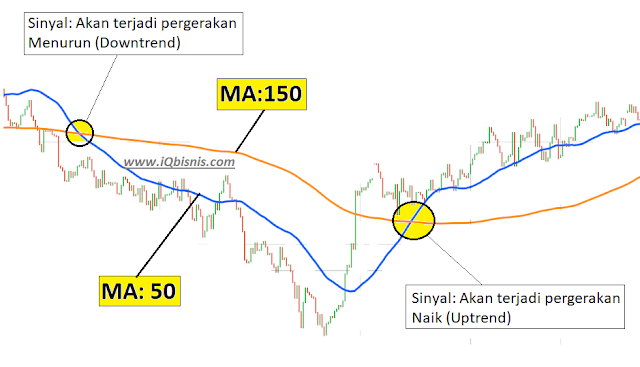 Type of the Moving Average indicator is Simple with the 50 period Moving Average indicator of the kind of Simple with a period of 160. When the 50 Period Moving Average Moving Average crosses 150 from top to bottom, predicted would happen down trend or movement of the Downtrend. When the 50 Period Moving Average Moving Average crosses 150 from bottom to top, predicted would happen or Ride the Uptrend trend movement. Well after knowing the trend of what will happen next, then it's time to determine the right moment to take the open positions. When the Moving Average line 3 (period: 5, a 10.21) gathered or exchanged crosses and the third line of the Moving Average is above the candlestick, then it is the right moment to take the option to sell (SELL). When the Moving Average line 3 (period: 5, a 10.21) gathered or exchanged crosses and the third line of the Moving Average is under the candlestick, then it is the right moment to take up the Option to buy (BUY). Well, if you are know and understand the use of the line above the Moving average, then combine the MA indicator 5. That's the way to predict when it will be the occurrence of a change of direction or trend reversal using Moving average indicator. You can also combine with the oscillator indicator like RSI, Stochastic, MACD.